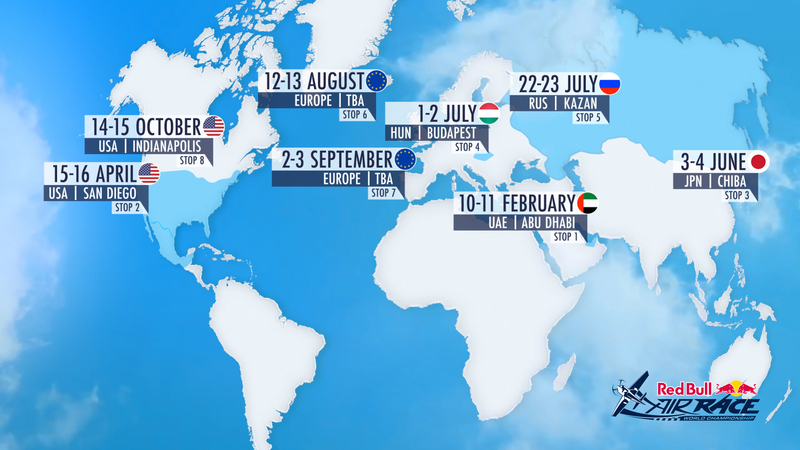 The Red Bull Air Race World Championship has released its full 2017 calendar. This year will feature a return to several fan favorites as well as thrilling new venues. This year will mark the 10th year the race series has chosen Abu Dhabi as the backdrop for its inaugural race of the season. The competition then returns to beautiful San Diego, CA for the first time since 2009. The seaside city of Chiba, Japan will host the Red Bull Air Race for the third time in early June. From there, the race pilots will once again fly low and fast over the Danube River in the hometown of the Red Bull Air Race, Budapest, Hungary. For the first time ever in its history the Red Bull Air Race will descend into Russia for a weekend of racing in the capital city of Kazan. The summer will feature two more race locations in Europe that will be announced shortly. Returning stateside for its climax, the season will conclude at the famous Indianapolis Motor Speedway, the “Brickyard” in Indianapolis, IN. Goulian and Team 99 gained significant momentum throughout the 2016 season, culminating in a record setting performance in Las Vegas before inclement weather brought the event to an early conclusion. With the confidence gained from that outing, and strategic lessons and insight gleaned at each race, Team 99 has its eyes on the podium for each stop of the 2017 Red Bull Air Race World Championship. Goulian Aerosports is an professional air show and air race team that performs at air shows in the USA and competes in the Red Bull Air Races World Championship worldwide. ©2016 Mike Goulian Airshows. All Rights Reserved.